Orders normally ship out in 24-48 hours or 1-2 business days. Canadian and other foreign orders may have Duties that UPS shipping rates do not include. Call or Email us for flat rate Postal service shipping options. Ironwear® is currently being used throughout the government and military. FBI, CIA, Army, Navy, and Marine trainers use Ironwear themselves to train cadets. We support our service men and women; and offer special military discounts and we ship to APO addresses throughout the world. We have a long history of developing custom training equipment to meet the rigorous demand of special operation training. Ironwear® ships packages worldwide on a daily basis. We have found that the United States Post Office offers the most reliable and economical means of shipping most Ironwear products to over 190 countries around the world. Priority Mail International Flat Rate boxes can weigh up to 20lbs and take about 10 business days to arrive at most destinations. We do not add on any handling fees, we only charge what the post office charges. US Post Office Flat boxes do not include any import fees or duty. If we are offering "Free Shipping" for USA orders at the time the order is placed we will reduce the price of the shipping by $10.00 for all orders over the minimum specified by the sale. Vest Racks, Balance Bows, and Med Blocks will NOT fit in a Priority Flat Rate box and the cost of shipping these items must be calculated based to the box dimensions, weight, and destination. We suggest that you order enough to fill the Priority Flat Rate box. Please order up to 19lbs worth of products per box. How to Place an International Order. 2. We will review your order and determine the number of flat rate boxes needed. 3. We will send you a PayPal invoice for the items and the shipping. Once the payment is processed we will process your order. You will get a tracking number from the post office that will let you track the location of your shipment. Please let us know when you receive your shipment and how you like our products. We have found that some orders get held up a day or two in customs. We have also found that Priority Flat Rate boxes go through customs faster than other shipments. Ironwear® strives to be the worlds best fitness company and trys to provide the best possible products and warranty. 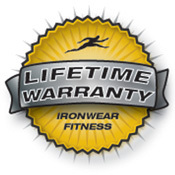 Ironwear® weight system are covered by our limited lifetime warranty. Ironwear Flexmetal weights (unlike the cheap weights our competitors use) are the most expensive part of our weighted products. Please call us if you have any issues with any of our weights. Your weights should last for years. Flexmetal weights consist of atomized high purity iron and thermoplastic elastomers, the thermoplastic elastomers can be degraded by chemicals and ultra violet radiation. Ironwear® vests and other weight product shells are covered by a lifetime material and workmanship warranty against defects. These shells are sewn out of the highest quality and most durable fabrics, please contact us if you have any problems and we will have you remove the weights and return the shell for repair of replacement. Fabric shells like all clothing will wear out over time, the amount of time depends on the type of use and care the shell receives , with normal use shells will last for years, however crawling on the ground for example will cause the shell to wear out quicker. For all of our vest shells, other adjustable weights such as wrist, ankle, pants, and shoe weights we offer new replacement shells for approximately half the cost of the product. For example we have many police departments, military, and football teams who have worn out their shells over the past 10 years who have replaced or upgraded their weights by buying new shells and use their old flexmetal weights. Merchandise can be returned for a refund or exchange for any reason within 30 days from ship date. After 30 days, merchandise must be unworn and unwashed to receive a refund or exchange. Refunds will be issued based on the original form of payment. Exchanges can be made for the same item in a different size or color only.We reserve the right to limit returns. We also can not refund shipping expenses. Join the growing worldwide network of Authorized Ironwear® Retailers. Ironwear® provides fast delivery on stocking orders. Ironwear® provides next business day drop shipment programs to ship products directly to your customers. Ironwear® provides identification programs which include retailer's logos and contact information on the products. Ironwear® provides custom products created especially for your customer base. Contact arnold@ironwearfitness.com if you are interested in becoming an Authorized Ironwear® Retailer. Ironwear® Trainers are professional trainers, teachers, coaches or doctors who use and train others with Ironwear® tools. Ironwear® Trainers can purchase Ironwear® tools at a discount for themselves and to supply to their trainees, students, or players. Ironwear® Trainers can take part in new Ironwear® tool development and evaluation programs. Ironwear® Trainers can take part in the creation and testing of new educational programs.